It takes moxie to show off an unfinished work. It’s unlikely that the audience will be satisfied by the piece since it isn’t whole. But maybe they will recognize what is there as quality work, and that the endeavor is on the right track. And that can be a valuable part of a larger process. To play the first act of Broken Age, then, is to become part of that process, as the full game will not be out until later this year. (Buying it means getting the first act now and the second act whenever it is released.) What is available now is half a game—not a short game, not a first episode, but an incomplete game that stops in the middle. It is quality work; it is on the right track. But to play it now is to be put out, to be left wanting more because there’s only a shard of it here, which isn’t enough. It’s disappointing, because based on what is there, Broken Age could end up being a mighty achievement. It’s an adventure game, the kind where you click on people to talk to them and drag objects onto other objects to solve logic problems and progress in a story. Broken Age contains two whimsical coming-of-age tales, which you can switch between at any time. One is about Shay, a boy who grew from childhood to adolescence alone in a nursery spaceship. The spaceship did not grow up with him, leaving him to play infantile games forever in a candy-colored prison. The other story follows Vella, a teenage girl who lives in a fantasy land terrorized by the immortal monster Mog Chothra. She is to be sacrificed to him, as her culture demands. Shay seeks real adventure, and Vella hopes to not die—and also to kill Mog Chothra, ending the cycle of violence. There’s a lot of talking in Broken Age, and that dialogue is delivered by interesting characters. (My favorite is Shay’s artificial-intelligence-powered, desperate-for-validation training spoon.) The script is written with wit and verve. The line delivery is expertly handled across the board and directed with comedic precision. Shay, for example, is performed by Elijah Wood, the sad-eyed Peter Pan of screen and stage. He is made to sigh, in a variety of lengths and volumes, at the end of almost every scene. This is correct usage of Elijah Wood. So it’s a funny game, but it’s also a wistful one, and there’s a quiet heartache in watching Vella and Shay dismantle the lives of their youth. The lovely storybook aesthetic, a unique handmade style that is deeply nostalgic, does a lot to drive the sadness. And the game, for its part, keeps on laughing. Then it ends—in the middle—right when everything is starting to come together. It is, in a sense, left on a cliffhanger, though it might be more accurate to say it falls off the cliff, no hanging involved. Nothing is resolved, and very little of the true nature of the worlds, or the journeys, is revealed. It feels like it’s finished right as it begins, and the disappointment is startling, like being shaken awake from a dream. 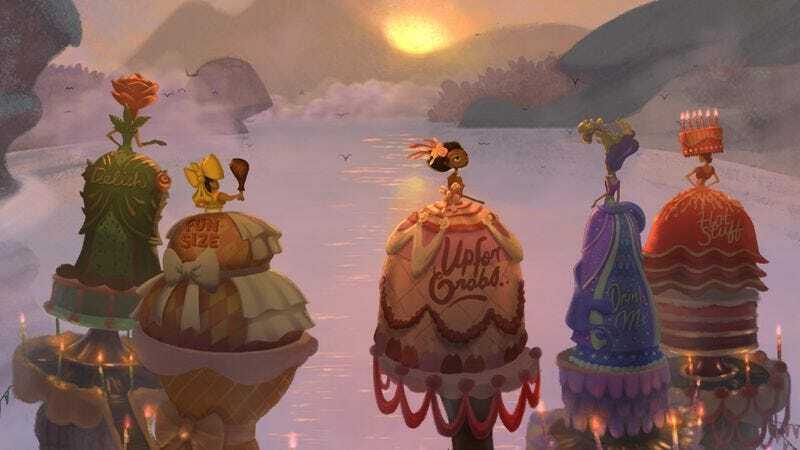 The reason Broken Age had to be split into two parts is not a secret—the game’s creation is largely an open book, thanks to its roots as an enormously successful crowdfunding initiative that promised frequent documentary updates. (Full disclosure: I put $100 into this initiative.) Suffice to say, the split was the best way out of a bad situation, forced by delays and dwindling finances in the face of overgrown ambition. Given the evidence in this first act, it looks like that ambition will pay off. And that’s exactly why it diminishes Broken Age to play it right now. It is lovely work, this first act, and I wish that I could unplay it so I could experience the game for the first time as a complete work. Instead, I’ll play a single game with a gap in the middle that will stretch months, picking it up again with the details lost and the nuance dulled by time. Or I could start over and lose the sense of exploration and wonder of those first introductory hours. No matter what, playing the first act now means giving up something later. The completed Broken Age could well be an excellent game, and I’ll be back when it’s finished to review it in its entirety. But the better the game turns out to be, the more of a disservice it is to play the first act now. To play it now is to be a part of a process. To play it later is to, well, play it.